It’s almost as if she’s heard the stories of her precociously articulate brother, stringing words together at his first birthday party. Baby Girl seems bent on doing the opposite, and at this stage I won’t be surprised if she’s still speaking in an endearing combination of tuneful babble, monosyllabic grunts and mime when she heads off to school. Seventeen months. No words. Count ’em: zero. Unless you count either ‘Uh-ooo’ (1. Oh dear, I have dropped something; 2. Oh dear, I see you have dropped something there. That looks messy. Allow me to assist by repeating ‘Uh-ooo’ until you’ve finished cleaning up), or ‘Bwaaaa’ (1. I love you, please brace yourself for a slobbery kiss; 2. Delivery of slobbery kiss). I’m not worried about her hearing or her smarts. She understands words just fine. In fact, she listens and follows verbal direction better than her brother does (or her father, for that matter, but that’s another blog post). She just doesn’t seem inclined to say any of the words she so clearly knows the meaning of. She’s obsessed with books, adores looking at pictures of animals, but makes only one Generic Animal Sound for all of them bar the snake. (Is ‘hsssss’ technically a word, do you think?). The Generic Animal Sound is both adorable and hilarious, because it doesn’t sound like any animal I’ve ever heard: ‘Nguck! Nguck! Nguck!’, voiced gutterally down in her throat. A lady thought she was choking the other day while we were out shopping. No, I had to explain, we just happened to be passing through the pet food aisle and she was pointing out all the bags displaying puppies and kitties and birdies and mice. Nguck! Nguck! Nguck! What does a tiger say? Nguck! Nguck! Nguck! 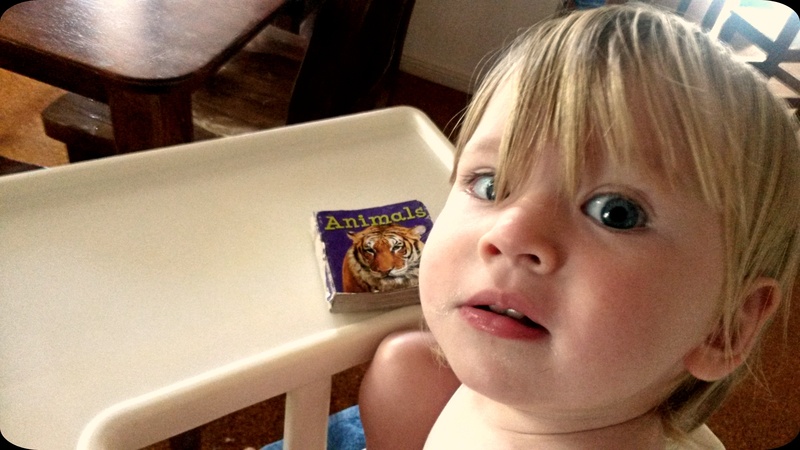 So, reading her animal book is fun, if a little repetitive. Sheep: Chortling, because apparently she thinks my ‘Baaaaa’ sounds like laughter, so has the idea that sheep are some kind of joke. I’m trying not to believe this means I laugh like a sheep. Duck: Nguck! Nguck! Nguck! (Actually, that’s not far from accurate. So, two animal noises in the bag then). I think she’s toying with me, to be honest. A month or so ago, I was thrilled when she finally started saying something that sounded like ‘Mama’! She’d often call it from another room in a sweet piping voice, then look surprised when I appeared. Or she’d pair it with her Generic Animal Sound, which I didn’t find complimentary – but I was happy to take what I could get, given how long I’d been waiting for this ‘Mama’. Which, if we’re being entirely objective, was really more of a ‘Mo-ma’, but who’s splitting hairs? Not me. Until the day she came trotting in to me, eyes shining with delight, sporting a lush beard of cat hair on her drool-soaked chin, saying ‘Mo-ma! Mo-ma! Bwaaaa Mo-ma! Nguck. Nguck.’, and I realised two things. 1. ‘Mo-ma’ = ‘Thomas’. Not ‘Mama’. Thomas is the cat’s name, stupid. 2. 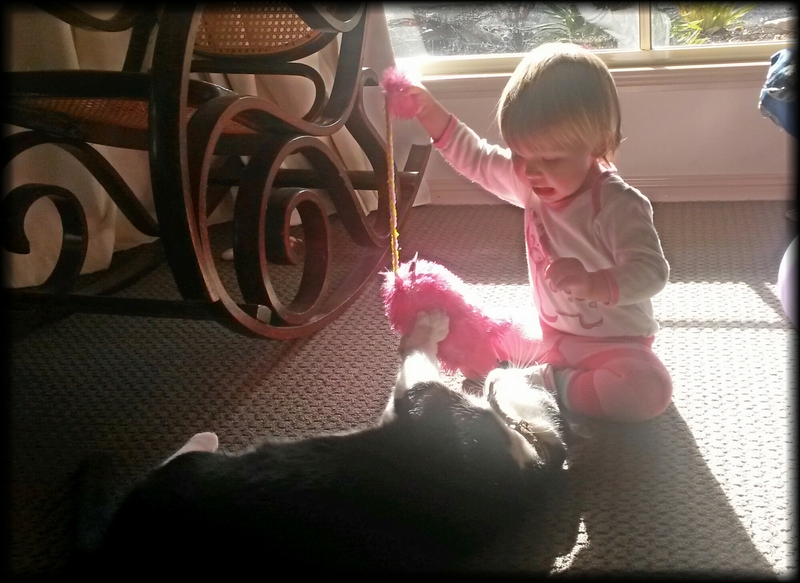 She’d just been pashing the cat. Bwaaaa! Bwaa Mo-ma! Nguck, nguck, nguck! Edited to add: To add insult to, er, existing insult, the cat was named after Thomas the Godforsaken Tank Engine. As if I needed another reason to despise that train. Beaten out by the cat. Harsh! I know, right? My first kid called me ‘Daddy’ for about four months. And now this. At least I know where I stand. I’ve heard this is common of subsequent children. They don’t need to speak because their parents are much better at figuring out their needs and their older siblings speak for them. Yes, I’ve heard it a lot too. It’s been a bit strange for us, being able to communicate so well with a non-verbal child when our first was (and is) such a chatterbox. Has that been your experience with G as well? No, actually we’ve had the opposite experience. G is even more articulate than E was. I put it down to the age gap between them. E wants to converse with G, not speak for him, and G adores E so wants to be like him. G’s first word was not Dada or Mama, but E’s name. Everything is working just fine. Will talk when she’s ready. Awww but she’s so cuteeeeee! Bwaaaa! I think she’ll be just fine. My brother learnt to speak by watching Dora the explorer. You know the Spanish cartoon? Ha ha this is so familiar! My eldest said NOTHING until she was two years old! She did however, have a growl for every emotion! But she understood everything we said. Once she started she would not shut up – Day and night!! My second is the opposite. Full on chatterbox already.. So my house is never quiet!